Uike, who had quit the BJP in 2000 and joined the Congress-led government, vacated his tribal seat of Marwahi from where Jogi later won and became the chief minister. 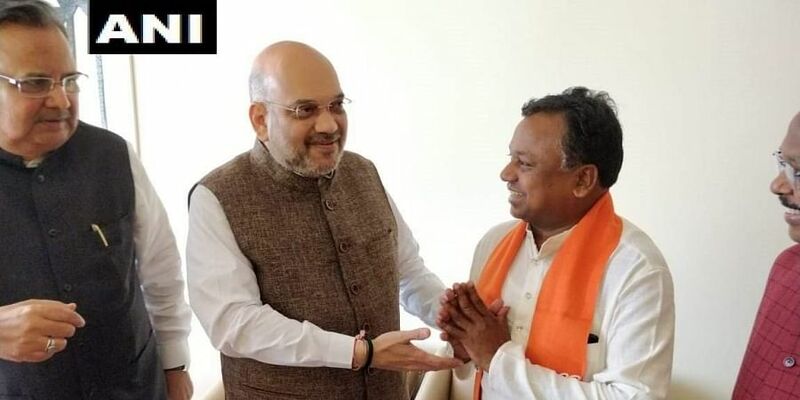 RAIPUR: In what could be seen as a shot in the arm of the Bhartiya Janata Party ahead of the Chhattisgarh polls, a working president of the Congress and a known tribal face Ram Dayal Uike has joined the BJP in the presence of the party chief Amit Shah at Bilaspur on Saturday. Chief Minister Raman Singh, state BJP president Dharamlal Kaushik and other senior party leaders were present during the occasion. While the BJP claimed the decision of Uike will strengthen the party to accomplish the mission of 65 seats, the opposition Congress expressed surprise over the development. "We feel astounded. But the Congress always have an alternative. A strong formidable candidate will replace him from the seat where he was likely to contest", said a senior Congress leader and leader of opposition T S Singhdeo. Uike, who had quit the BJP in 2000 and joined the Congress-led government, vacated his tribal seat of Marwahi from where Jogi later won and became the chief minister. Uike, a four-time MLA, giving a major setback to the Congress, said that he has been feeling suffocated in the Congress party which no longer remains a real well-wisher for the tribals. During the previous one month, Uike was apparently disenchanted with the reported inclination of the Congress party to enter into an alliance with a tribal-based Gondwana Gantantra Party (GGP) and further meditating to allocate GGP a reserved Scheduled Tribe (ST) seat of Pali-Tanakhar (in Korba district), which was represented by Uike for last last three terms. President of GGP Hira Singh Markam stood at number two on Pali-Tanakhar constituency with the BJP at a third spot in the previous two elections. "Switching sides or changing allegiance to other political party happens before elections. Uike who earlier left BJP to join Congress and again returned to BJP must have assessed his own personal gain. Though as a senior Congress leader he didn't command the same popularity as earlier-", opined Ashok Tomar, a political analyst. It remains to be seen what repercussion Uike's decision might carry in the political arena of the state, his rebellious move is expected to deliver a major blow to the opposition Congress, which is out of power in Chhattisgarh since 2003. In Chhattisgarh Congress, besides the president there are two working presidents one each belonging to ST and SC. Elections to the 90-member state assembly are scheduled to be held on November 12 and 20.